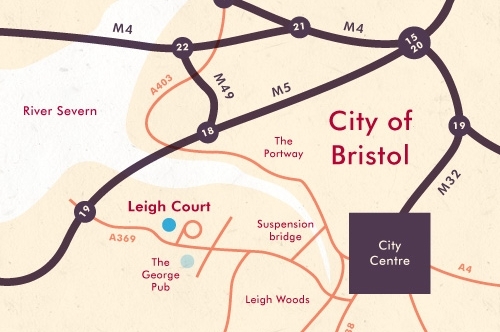 From Clifton, follow signs for Clifton Suspension Bridge (toll). Over bridge, at first set of traffic lights (junction with Rownham Hill) turn right onto A369 towards M5 motorway. At next set of lights (junction with Beggar Bush Lane) go straight across, still towards motorway. Enter outskirts of Abbots Leigh; continue past The George Inn on left, caution as the road narrows. As road bends, prepare to turn right into the drive leading to Leigh Court. Continue along driveway passing Brackenwood Nurseries on right and Freeways Day Centre on left. The road sweeps into a one-way system and leads to main house. Please follow signs to the car park. Take A369, following signs for Easton – in – Gordano and Clifton. Pass the Rudgeleigh Inn on your left. Follow the road past the petrol station on your right. Enter outskirts of Abbots Leigh, passing signpost on your left for Ham Green/Pill. Continue along A369, down the hill; prepare to turn left into the drive leading to Leigh Court. Continue along the drive passing Brackenwood Nurseries on right and Freeway Day Centre on the left. The road sweeps to the right into a one-way system that leads to the main house. Please follow signs for the car park.